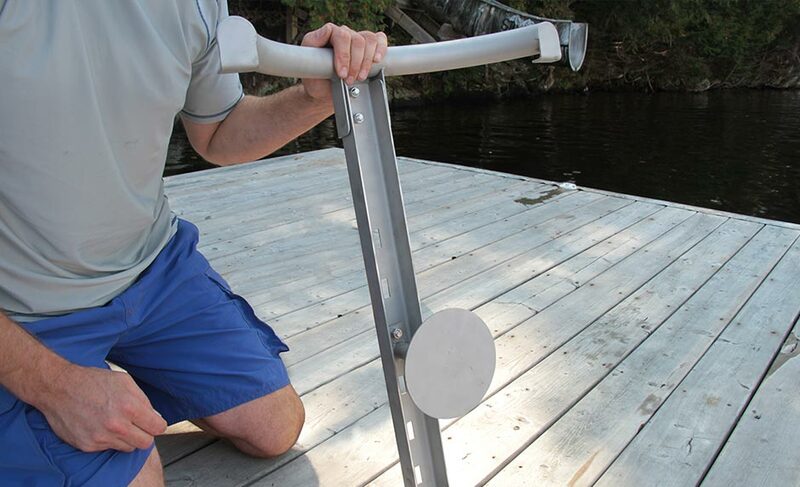 Installing your Dock Stool should take approximately one hour, and the process is simple. We’ve even created a step by step blog and video to walk you through it. An ice-cold drink is one of the first tools needed for proper installation (in our minds at least). You don’t need to completely uninstall your Dock Stool to clean it. Simply detach it from your dock, give it a good spray with your garden hose, and wipe it down with whatever rag you have handy. For any stubborn, stuck on dirt a little dish soap will do the trick without the use of harsh chemicals. Just reattach your Dock Stool when you are done, and you are good to go. We recommend a monthly cleaning but feel free to find a schedule that works best for you! It’s a good idea to remove and store your Dock Stools for the cold, winter months or if you are going to be away for an extended period of time. Have limited storage space at your cottage? The parts can be easily dismantled into smaller pieces, allowing you to conveniently store them during the off seasons. With such easy installation and maintenance why stop at just one Dock Stool! Take advantage of our 3 for $999 deal and create your own swim up bar…your friends and family will thank you. Order online today at www.dockstool.com so you can sit down, cool off and enjoy the best seat in the lake - all summer long!